The site of Anthony&apos;s Pier 4 in Boston. The former site of Anthony’s Pier 4 has new owners, and they’re thinking a little bigger than popovers. The New York real estate giant Tishman Speyer has purchased the property for $70 million from New England Development and expects to begin construction this year on two buildings that will contain offices, condominiums, and restaurants. Its plans also call for a one-acre waterfront park on the spot where Anthony’s stood for half a century. Once one of the country’s busiest eateries, it shut its doors last year. Tishman Speyer co-chief executive Rob Speyer said the compoany was drawn to the nine-acre property by its waterfront location and the real estate renaissance that has unfolded around it in recent years. New England Development previously obtained city approval to build a 1 million-square-foot project on the property with offices, homes, a hotel, restaurants, and a large waterfront park. So far, only part of that plan has been implemented. New England Development signed a deal with another developer, Hanover Co., to build a a 21-story apartment building at the edge of the pier along Northern Avenue. That building is scheduled to be completed this spring. Tishman Speyer bought the rest of New England Development’s property in December and intends to work within the zoning footprint already approved by regulators. It still must obtain approval for the designs of its new buildings from the Boston Redevelopment Authority. Speyer said the company intends to start construction on both of those buildings by the end of the year, whether or not it has signed an office tenant. Its 13-story office building is being designed by Elkus Manfredi Architects of Boston. Tishman Speyer has hired the architectural firm Diller Scofidio & Renfro of New York to design its condominium building. The nine-story structure will contain 100 luxury units and be designed to make a “dramatic statement” on the waterfront. Pier 4 is already surrounded by heavy construction activity. Two office buildings are rising nearby, and developer John B. Hynes III recently started construction of a massive apartment and retail complex across from the John Joseph Moakley US Courthouse. 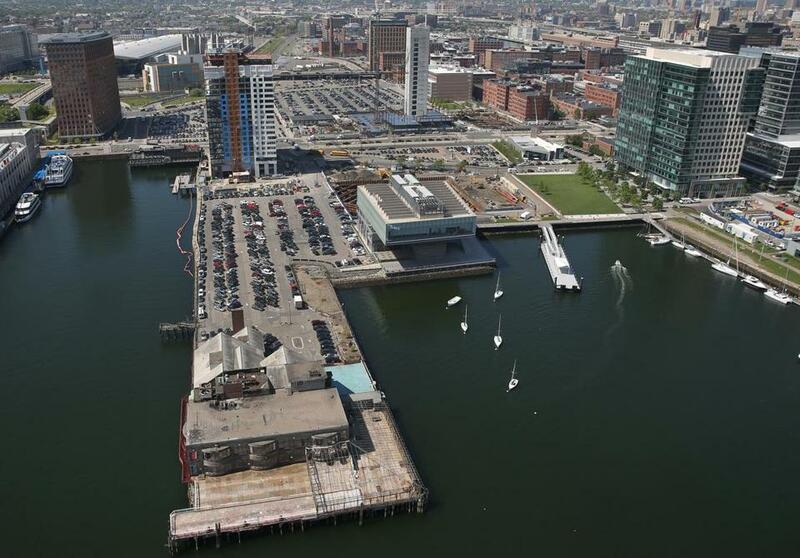 Tishman Speyer will be among the first out-of-town developers to build a major project in the Seaport. It owns an international portfolio that includes office towers at 125 High St. and One Federal St. in Boston, but has never developed anything in the city. “This will be our first opportunity, and we want to make the most of it,” Speyer said.